Astro On-The-Go Now Available For Android Devices! 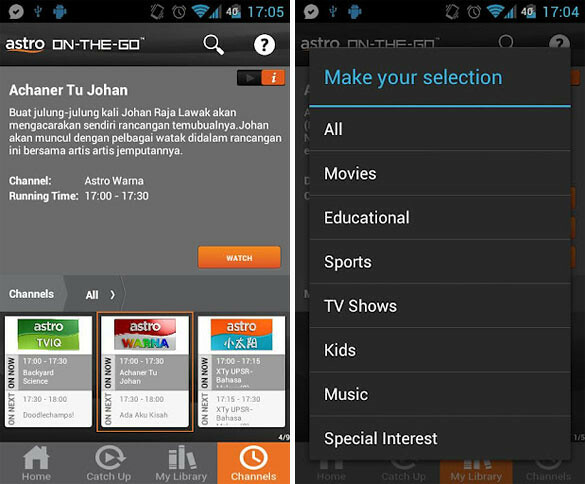 Watch the best of Astro with Astro On-The-Go, now available for selected Android devices —an innovative service which delivers non-stop entertainment anytime, anywhere. With Astro On-The-Go, customers can enjoy immediate access to Astro TV and Radio Channels, LIVE Events, Video-On-Demand (VOD) and Catch Up TV across multiple online and mobile devices. 4 Responses to "Astro On-The-Go Now Available For Android Devices!" Tak ada ke astro on-the-go untuk samsung galaxy note 2?? Note 2 takdak.. pakai fon oldskul salah, fon latest salah hurmm..
Biler leh tgk astro kt note 2 nie..huhuhu..